Allergic rhinitis (AR) is a common medical condition and its prevalence is increasing worldwide.1 In the United States, up to 15% to 30% of the population is affected with AR.2 The onset of symptoms is highest in adolescents, although symptoms may begin at any age. Studies have shown that as many as 10% of children and 20% to 30% of adolescents suffer from AR.3 The symptoms can adversely affect the quality of life of patients and thus are associated with significant morbidity.4 Patients can experience fatigue, sleep disturbances, mood changes, anxiety, and learning difficulties that decrease work or school performance and productivity. Some of the medications used to treat AR can also cause drowsiness as well as memory and learning impairment.5 Moreover, it may be associated with other comorbid conditions such as asthma, atopic dermatitis, sinusitis, and otitis media with effusion, which can further impair quality of life. The goals of treatment of AR are effective prevention and symptom relief. The initial treatment approach is prevention, which includes identification and avoidance of triggers. This helps in reducing the symptoms as well as the need for medications, but allergen avoidance is not always possible. 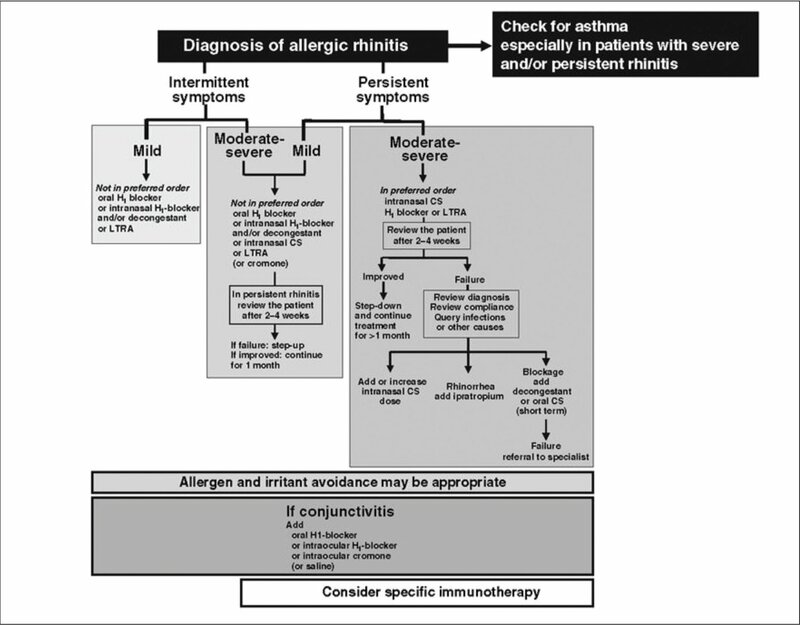 Algorithm for the diagnosis of allergic rhinitis. Reprinted from Bousquet et al.,6 with permission of John Wiley and Sons. INS are more effective and offer significant advantages compared to other medications that are used to treat AR, such as antihistamines.7 They are more cost effective than nonsedating antihistamines, which are the most commonly prescribed AR medications. A meta-analysis of 2,267 patients showed that INS provide much greater relief of nasal symptoms such as nasal blockade, rhinorrhea, sneezing, itching, and postnasal drip as compared to antihistamines.7 They have also been shown to be more effective than leukotriene modifiers.8 INS have been shown to be significantly more effective compared to antihistamine nasal spray in controlling the symptoms of perennial allergic rhinitis.9 A prescription combination of the nasal steroid fluticasone and the nasal antihistamine azelastine appears to improve symptoms of AR better than either drug alone.10 It is approved for use in people older than age 6 years, and the recommended dose is 1 spray in each side of the nose twice a day. Common side effects include bad taste, nose bleed, and headache. 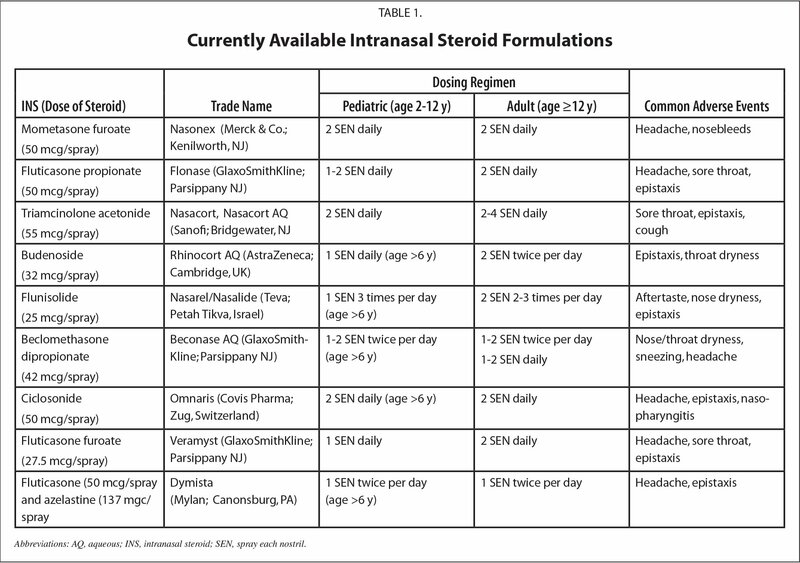 Therapy with INS improves all nasal symptoms of AR including nasal congestion, itching, rhinorrhea, and sneezing.6 INS are more effective than other available agents and improve health-related quality of life without causing sedation.11 Currently, several INS, including beclomethasone dipropionate, flunisolide, triamcinolone acetonide, and budenoside, are approved for clinical use. Newer formulations include fluticasone propionate and mometasone furoate. All the available agents are effective in the treatment of both seasonal and perennial AR and other chronic inflammatory nasal diseases. The newer drugs, such as mometasone furoate and fluticasone propionate, have higher lipid solubility and topical potencies as well as lower systemic bioavailability compared to older molecules, and thus are associated with fewer systemic effects. Glucocorticoids act on different components of the allergic process including the inflammatory cells as well as the mediators involved. They inhibit the influx of mast cell and eosinophils in the nasal epithelium, which play an important role in allergic inflammation. They also mitigate the release of inflammatory cytokines such as interleukin (IL)-1, IL-2, IL-4, and tumor necrosis factor-alpha. Vascular permeability and mucus production is also decreased. These factors together play a role in diminished symptomatology and clinical benefits related to the use of INS.16 Fokkens et al.16 reported that intranasal fluticasone reduced the numbers of antigen-presenting cells, eosinophils, and IL-4 and IL-5 in the nasal mucosa of patients with AR. INS differ from each other in regard to their sensory attributes (perceived discomfort, taste, or smell), which tend to affect patient acceptance and compliance.27 A recent survey showed that in patients who use INS, the most important sensory attribute is aftertaste.28 Other factors include nose runout, throat rundown, smell, and feel of the spray. Patients tend to have higher preference for INS that have lower intensity of unfavorable sensory attributes. These sensations are caused by the additives and preservatives used in INS preparations. INS that contain benzalkonium chloride (BKC) tend to be less acceptable than INS without BKC, because BKC has an unpleasant, bitter taste.28 Most of the available INS are isotonic formulations that cause decreased local concentration and absorption of the active ingredient into the nasal mucosa. On the other hand, hypotonic formulations increase the pharmacologic activity and absorption of nasally administered drugs, thereby potentially affecting the efficacy. Most commercially available INS have spray volumes of about 100 mcL per actuation; however, the spray volumes of budesonide and ciclesonide are less (Table 1). A smaller spray volume decreases the amount of drug that can run down the back of the throat or leak out of the nose. Clinical trials have shown that symptomatic relief can be achieved with once-daily dosing of different INS, including fluticasone propionate, mometasone furoate, budesonide, and triamcinolone acetonide.29 All available formulations appear to exert similar effects in this context. To minimize the potential for systemic side effects, it is important to use INS properly. Some of the measures include once-daily dosing as compared to twice-daily dosing. In cases of acute inflammation, high doses of INS can be used initially and then steped down to a lower dose when the acute inflammation has subsided. Administering the corticosteroids in the morning minimizes the effects on the HPA axis. INS are highly effective drugs for treatment of AR and are more efficacious than other groups of medications such as antihistamines, leukotriene modifiers, and decongestants. There are several formulations now approved for clinical use. Corticosteroids have a delayed onset of action and should be used daily for maximal benefits. INS can alter the immune response to allergen exposure and thus have the potential to alter the clinical course of AR. Systemic absorption is low, so systemic effects are rare. Attempts should be made to use lowest doses of INS to decrease potential for side effects. Hagy GW, Settipane GA. Bronchial asthma, allergic rhinitis and allergy skin tests among college students. J Allergy Clin Immunol. 1969;44:323–332. DeWester J, Philpot EE, Westlund RE. The efficacy of intranasal fluticasone propionate in the relief of ocular symptoms associated with seasonal allergic rhinitis. Allergy Asthma Proc. 2003;24(5):331–337. Smith CL, Kreutner W. In vitro glucocorticoid receptor binding and transcriptional activation by topically active glucocorticoids. Allergy. 1997;52(suppl 36):S29–S32. Haye R, Gomez EG. A multicentre study to assess long-term use of fluticasone propionate aqueous nasal spray in comparison with beclomethasone dipropionate aqueous nasal spray in the treatment of perennial rhinitis. Rhinology. 1993;31(4):169–174. Berkowitz RB, Nolop RB, Mesarina-Wicki BE. Onset of action of mometasone furoate (Nasonex) nasal spray in seasonal allergic rhinitis [abstract 1790]. J Allergy Clin Immunol. 1997;99(Suppl):S441. Newman SP, Moren F, Clarke SW. Deposition pattern of nasal sprays in man. Rhinology. 1988;26:111–120. Minshall E, Ghaffar O, Cameron L, et al. Assessment by nasal biopsy of long-term use of mometasone furoate aqueous nasal spray (Nasonex) in the treatment of perennial rhinitis. Otolaryngol Head Neck Surg. 1998;118(5):648–654. Rachelefsky GS, Chervinsky P, Meltzer EO, et al. An evaluation of the effects of beclomethasone dipropionate aqueous nasal spray (Vancencase AQ [VNS]) on long term growth in children [abstract]. J Allergy Clin Immunol. 1998;101(suppl):S236. Allen DB, Meltzer EO, Lemanske RF Jr, et al. No growth suppression in children treated with the maximum recommended dose of fluticasone propionate aqueous nasal spray for one year. Allergy Asthma Proc. 2002;23(6):407–413. Divya Seth, MD, is an Assistant Professor, Division of Allergy/Immunology, Wayne State University School of Medicine, Children's Hospital of Michigan. Deepak Kamat, MD, PhD, FAAP, is a Professor of Pediatrics and Vice Chair for Education, Wayne State University School of Medicine; and a Designated Institutional Official, Children's Hospital of Michigan. Address correspondence to Deepak Kamat, MD, PhD, FAAP, Children's Hospital of Michigan, 3901 Beaubien Boulevard, Detroit, MI 48201; email: dkamat@med.wayne.edu.